J.J. Abrams‘s Star Trek film reboot has received decidedly mixed reviews. While mainstream audiences and critics have been largely positive, many Trek fans decry what they see as action and spectacle taking a front seat to the cerebral aspects of the television series. 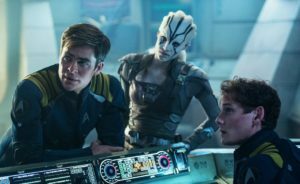 With Abrams jumping franchises to Star Wars: The Force Awakens, long-time fans might have been excused for deep skepticism at the selection of Justin Lin, known most recently for The Fast and the Furious sequels, to direct the third Trek reboot, Star Trek Beyond. The film opens with (you guessed it) an action scene, Kirk (Chris Pine) keeping on his diplomatic toes. However, we quickly learn that the good captain is struggling at more than diplomacy, and is even contemplating leaving the ship due to the ennui of a long space mission. Spock (Zachary Quinto) is going through his own struggles in his relationship with Uhura (Zoe Saldana), deepened when he hears of the death of his alternate-timeline self, Ambassador Spock. The film returns to lighter territory (which predominates, very much welcome after the overdone doom and gloom of Into Darkness) when the crew sets out on a rescue mission for another starship. The villainous Krall (a heavily made-up Idris Elba) enters the picture, and the stage is set for the Enterprise crew to face yet another threat to the Federation. The announcement that geek favorite Simon Pegg (Scotty) would write an original script with Doug Jung calmed some fan angst, and the final story does have some nice touches. The central crisis of the plot results in the crew of the Enterprise being split up, and the bouncing between the different teams works at times, particularly in the classic pairing of Spock and Dr. McCoy (Karl Urban). The cast has started to make the roles their own, meshing together in the best Trek tradition. Sofia Boutella as damsel-not-in-distress Jaylah is a nice addition, as well. Sadly, though, the script fails in its attempts at deeper characterization, most notably with its villain. There is no shortage of dull, muddled villains in Hollywood these days, and Krall joins them, even with a hurried attempt at explaining everything in the third act. Lin and Pegg are both avowed Trek fans, but their film ultimately comes off as slight, an intermittently fun action episode that does not linger in the mind like the best of the series. Given fan reaction to the reboots, and the checkered past of both the original cast and Next Generation films, those who believe Trek works best, first, and foremost, on television may have a point. There are certainly enjoyable moments to be had in the Trek movies, and at least one minor classic, but the poignancy of the one-hour television format seems to rarely translate to the big screen.